HIGHEST SPECIFICATION JIMNY I HAVE EVER SEEN - SIMPLY STUNNING. THIS LOVELY EXAMPLE COMES FULLY LOADED WITH SUZUKI FITTED SNORKEL, LIGHT PROTECTORS AND TRAY RUBBERS, NOT TO MENTION THE AIR CONDITIONING AND HALF LEATHER INTERIOR. FULL SERVICE HISTORY AND ONLY COVERED AN INCREDIBLE 47,000 MILES. MUST BE SEEN TO BE FULLY APPRECIATED! JUST ARRIVED! 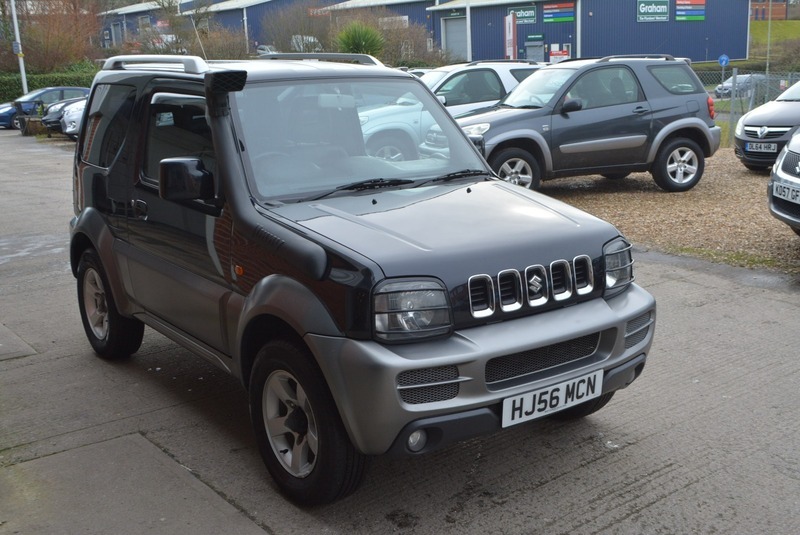 Here e have a stunning SUZUKI JIMNY VVT 1.3L PETROL MANUAL 3 DOOR 4X4 in black metallic with black half leather interior in truly exceptional, unrivalled condition throughout. This lovely example comes with full service history at intervals of 5k, 18k, 30k, 32k, 34k, 36kk & 37k having now only covered 47,000 miles with a new MOT and service conducted at point of sale with 2 months comprehensive nationwide warranty and 12 months AA breakdown cover. Coming fully equipped with a genuine Suzuki snorkel, front and rear light protectors, alloy wheels, air conditioning, rear mounted spare wheel, electric windows, aftermarket double din Sony stereo fitted, electric mirrors and two keys.